How do you create a connection (sambandha) in your devotional practices? I have been contemplating my mood when I chant, and I don’t know how to describe it except neutral. There isn’t much service mood there and trying to force a mood is difficult. Even thinking in those terms, doesn’t make a mood come through. I watch TV and what I really like is the way I disappear when watching something. I completely forget my life and situation, and I’m absorbed into the TV series. But even series are loosing its hold on me, and I find myself with more time for devotional practices. What strikes me is how difficult it is to feel a connection. I have been at the place where I looked so forward to the times where I could spend the rest of the evening hours for devotional activities. It was with such joy, and then the feeling of connection was there. But then I had spent time at work reading and going into siddhanta. It’s unusual I have time for that at work. Usually I chant, read etc. but with a neutral feeling. I like those activities, but I’m still often neutral and with no or little feeling of connection. What am I missing? What is it that I’m lacking in my knowledge/understanding? As I’m trying to enter the maha-mantra more, I’m struck by the importance of offences versus sin. By just uttering the maha-mantra once I consider all my sin to be gone. I don’t care about sin, sins performed in previous lifes or this life. I don’t even care much about the sin I’m performing now, because I know it’s of little consequence as long as I’m sincere in my efforts to improve spiritually. It might sound like I’m taking the process and vanquishing of sin easily, but it’s not. I have just realized how fleeting and temporary sin is. I have also realized how potent the maha-mantra is in regards to sin. I have been reading the story of Ajamila, and it have been real instructive on just how potent the maha-mantra is. I’m more interested in the part where the maha-mantra removes material desires, as this is more my problem. Though even that I find is of little consequence. 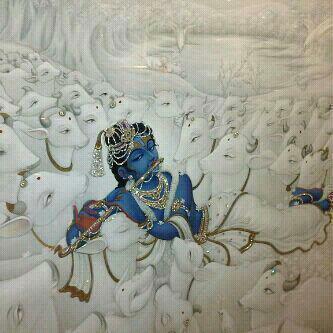 The only method to vanquish material desires is devotional service. So really, all I’m left with is to continue working on my devotional practices and everything will fructify in time. Which I really find spiritual life about, vanquishing obstacles and letting spiritual realizations mature over time. I can speed up the process though. I know reading about the different stories that are instructive on removing different obstacles is a huge help (just like the story of Ajamila have been in understanding the maha-mantra). When I encounter a problem, I can look up in Srimad-Bhagavatam on the instructions to remove it. The recent action of mine that really sped up my process was when I decided to stop reading material books, and just read devotional books. A flood gate opened up then and I receive more input that I’m able to process – and I love it, of course 🙂 It’s so inspirational. Offences though are the grave ones. Offences is about the attitude in which you chant and live. Offences is the block in developing humility and service attitude. Offences blocks the development of love, for the mercy to get through to us. But again I find me asking the same question: Are they really that important? Aren’t offences fleeting, just as sin? If one just keeps on chanting, working, and being sincere: Will not all offences dissolve over time? Let’s say I commit an offence. Hopefully over time I will realize that I have committed an offence and then I will repent and ask for forgiveness. I know many people have trouble with asking forgiveness because of pride, but I have asked forgiveness many times more than I have received it. If pride is my issue, then I can read Srimad-Bhagavatam and the corresponding stories on how to vanquish pride. 10. To not have complete faith in the chanting of the holy names, and to maintain material attachments, even after hearing many instructions on the matter It is also an offense to be inattentive while chanting. The solution: To keep chanting. I just find material life and all it’s components to be really fleeting. Thereby, even sin and offences just seem very fleeting to me.